Six authors look at the history of Bolivia, the struggles involving workers and indigenous people, the coalition which formed itself into MAS – the movement towards socialism – and the election of Evo Morales, the first ever indigenous President. Susan Jappie reviews. This book, made up of six essays by authors with close academic and personal connections to this inspiring revolutionary regime in South America, is the result of an initiative by the Bolivian Information Forum for a Symposium, which was held at the Institute for the Study of the Americas in 2009. The essays explore the origin and development of the Movement towards Socialism, or MAS as it is known, from the start of the 21st century, when the neo-liberal government’s attempt to privatise the Bolivian water supply led to the Water Wars and other social movements that challenged the status quo. This coalition of social forces succeeded in getting rid of the government and in May 2006, MAS leader Evo Morales became the first indigenous president in South America. His first term in office is examined for its political and economic innovations. The first essay by Herbert Klein looks at the historical background to the MAS movement, beginning with an earlier revolution in 1952, when the rights of the indigenous and mestizo people who make up the majority of the population, were first recognised and the white élite began to lose their power. The next period was from 1970s when urbanisation shifted the balance of power away from the peasants, but the indigenous people nonetheless kept their identity through language, national dress and a persistent upholding of the small farmers’ production of the coca leaf for export and local consumption. During the ‘90s the New Economic Plan was the toxic shock that sent the country into recession with the workforce declining to a fifth of its previous size. This led to popular discontent and the rise of indigenous social movements, including MAS, which was responsible for changes in the law governing the exploitation of Bolivia’s recently privatised gas reserves. MAS was one of the movements that forced a referendum which led to re-nationalisation. The next chapter, written by PhD student Sven Harten, focuses on the changes in MAS' organisation, as it has transformed itself from a popular social movement into a political party. It reached out to include urban intellectuals, including Morales’ vice-president Alvaro Garcia Lineas. Harten’s work is based on a long period of participant observation among the coca growers and interviews with political leaders. He uses “discourse analysis” to consider the problems facing MAS. He considers the ‘equivalence’ and ‘difference’ between bottom-up and top-down politics. There has always been a potential rift between the indigenous majority in the Western highlands and the more mixed and middle class areas in the Eastern lowlands. Harten suggests that the rise of Morales is as significant as that of Nelson Mandela in post-apartheid South Africa. In order to overcome the potential divisions, Morales has emphasised the ‘pluri-national’ identity of Bolivia, preserving the languages and identities of the different ethnic groups, two of which he represents: the Quechua and the Aymara. Willem Assies, a Dutch academic (to whom this book is dedicated as he died on the fifth anniversary of MAS coming to power) emphasises the importance of the changes that Morales made to the Constitution. These gave the state a greater role in the exploitation of Bolivia’s natural resources, including hydrocarbons, and metals. This tiny country is in the strange position of having globally significant deposits of lithium and iron ore. More controversially, Morales made provision for regional autonomy and this gave rise to major upheavals. Ferocious opposition came both from opponents of the idea and from those who believe the changes do not go far enough. John Crabtree, “hotfoot back from Bolivia” uses electoral statistics since MAS came to power, to chart its steady rise in support from victory in 2005 with 54% of the vote to 67% in 2008. Crabtree looks at the price MAS has paid for widening its support to towns and cities, and to the middle classes, which may undermine the movement’s original base in rural areas. But overall we see how the success of MAS stems from Morales’ leadership: the way in which he has filled the vacuum left by the exhaustion of other parties, his support for the role of indigenous politics and his economic policy, based on re-nationalisation of gas and mineral resources, with the income used to create a fairer society. Morales and MAS have promoted the indigenous concept of “vivir bien” or “living well”, which values the relationships between human beings, and the environment, and sees these as central to a good life, as opposed to the idea that happiness lies in increased consumption. The tax from gas revenues has been used for programmes to support vulnerable groups such as the elderly, families with children attending school and improving rural health. Opposition parties have joined together to block legislation and appointments, and worse. Morales survived an attack on MAS when a wave of violence was unleashed against him in the run-up to the 2008 elections. In fact, this actually led to an unprecedented surge in his popularity, giving him a two-thirds majority. But Crabtree and other authors are concerned about the question of his successor, as Morales has said he will step down after his second term. At this point the loose structure of MAS could be exploited. 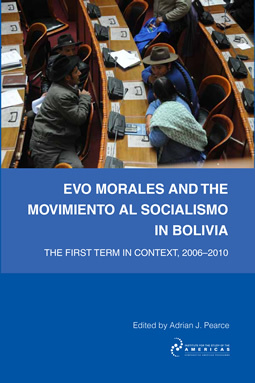 The penultimate essay deals with the changing relationship between Bolivia and the USA, which is the keystone of Morales’ success in challenging the hegemony of North America in three different spheres: the so-called war on Communism, US opposition to coca growing and the “war on terror”. MAS’ robust attitude to the US has given a lead to other countries that would like to operate outside the Washington Consensus. The final essay is in the form of a diary, kept by James Dunkerley between 2008 and 2010, when Bolivia faced the crises around the new constitution and regional autonomy. He reflects on some of the “Pachakuti” or “continuities and changes”, using a more spontaneous style to capture the indigenous concept of cyclical and unpredictable happenings! Altogether this is a very engaging book for anybody who, like me, is inspired by the Bolivian example.